1. Preheat the oven to 200°C, gas mark 6. Place the tomatoes in a small roasting tin and dot with the tapenade. Sprinkle with the garlic and arrange the frozen mackerel fillets on top, skin sides face down. Beat the crème fraîche with 2 tbsp water and plenty of black pepper, and spoon over the mackerel. Cover with foil and bake for 15 minutes. 2. Crumble the oatcakes into a bowl and break them up a little more by tapping with the end of a rolling pin. Stir in the cheese and parsley, and sprinkle over the fish. Return to the oven, uncovered for 15 minutes until the topping is lightly browned and the fish cooked through. Serve with a leafy salad. 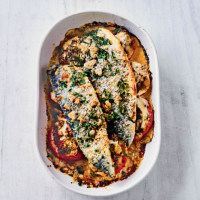 Cook’s tip A pack of frozen mackerel contains four fillets, so it’s easy to double up this recipe to serve four. Or keep the remainder in the freezer for another dish. High in omega 3, 1 of your 5 a day.